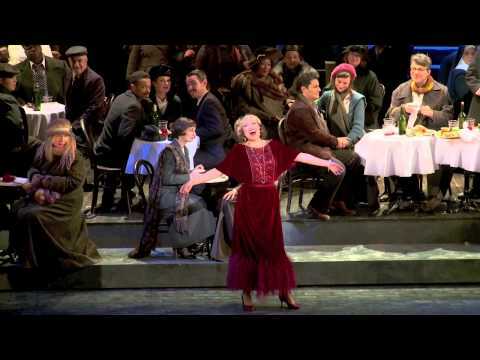 Last Thursday evening I was pleasantly surprised by the Washington National Opera’s new staging of one of the most perfect and enjoyable operas ever written “La Boheme”. Puccini’s work presents limitless opportunities for every generation of singers. “La Bohème,” is all about young artists in mid-19th century Paris — six principal characters struggling to survive poverty, insecurity, illness and a harsh winter. It’s an opera of heightened emotions, with timeless melodrama with just the right blend of youthful vitality, dramatic fervor and inspired vocalism. Opera lovers never seem to tire of Puccini’s magnificent score. The opera begins in the garret shared by the poet Rodolfo and the painter Marcello. This is where Rodolfo and the seamstress Mimi fall in love, and you could almost feel the cold of the sparsely furnished garret. Act one’s boisterous street scene outside the Café Momus and the wintry Act III confrontation on the outskirts of Paris yield striking stage pictures, atmospherically shaded by lighting. Act IV brings the characters back to the garret for the opera’s shattering conclusion. It was very interesting that the setting was World War I instead of the original 1830’s. Tatiana Monogarova has a powerful voice which at the beginning made it hard to believe that she was the physically weak Mimi. Alexey Dolgov’s depiction of Rodolfo made the role youthful and energetic although his voice at times seemed not to project vocally. A constellation of supporting roles included Leah Partride who played the part of Musetta beautifully. Trevor Scheunemann’s (Marcello) complemented lyrically Musetta. Christian Bowers (Shaunard) rounded out vocally strong as was Musa Ngqungwana’s (Colline). The musical director of the Washington National Opera Phillippe Auguín seemed very heavy handed in volume which caused the tenor to be drowned out. The feast for the eyes was the seam less transformation of scenes from the bleak dark attic room scene to the colorful world of the Latin Quarter that can compete with the Zeffirelli’s Metropolitan Opera of New York. Don’t take my word, judge for yourself.